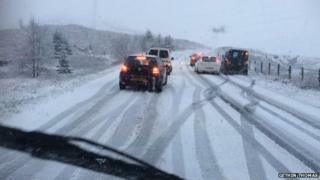 Motorists have been warned of treacherous driving conditions in parts of Wales following a night of snow, rain and plummeting temperatures. In many places it dipped below freezing, and the Met Office has issued a yellow "be aware" warning for ice. Gritters were dispatched, but travel disruption is expected on Saturday. The areas worst affected by ice are Ceredigion, Conwy, Carmarthenshire, Powys, Gwynedd, Monmouthshire, Denbighshire, Wrexham and Flintshire. Drivers are advised to take care as icy stretches continue following a spate of crashes on Friday, including on the M4, A470 and mountain roads.